...click through each step as you progress towards your destination. 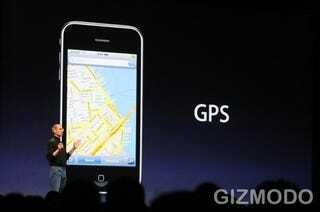 Now the iPhone's map features will use location-based, Wi-Fi and real-boy satellite GPS for tracking. The 8GB iPhone 3G will have a price tag of $199, which can definitely compete with standalone GPS navigation units, like those available from TomTom and Garmin, plus you get a cell phone and much more. It will be available July 11. Check out more live coverage of all of the iPhone 3G announcements at Gizmodo.